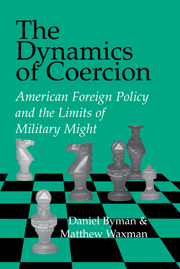 This book examines how the United States uses limited military force and other means to influence adversaries and potential adversaries. It reviews when limited force can and cannot work and examines a range of current challenges, including those of guerrilla groups or minor powers armed with nuclear, chemical, or biological weapons. It also looks at the complications arising from domestic politics and the difficulties of using force in an alliance. 1. Introduction; Part I. Coercive Strategy Making: 2. The theory of coercion; 3. Coercive Mechanisms; 4. Coercive instruments; Part II. The Context of Coercion Today: 5. Domestic politics and coercion; 6. Coercion and coalitions; 7. Humanitarian coercion and non-state actors; 8. Weapons of mass destruction and US coercion; Part III. The Future of US Coercion.